For any budding hunter, learning how to shoot a deer is right up there with learning how to set a campfire in the backcountry. When we start learning our hunting craft, it can seem a little bit daunting as there’s so much to learn. Make sure you also check out our top 25 deer hunting tips. Unless you like going for long walks in the backcountry, hauling all your gear in and then out again I’d say learning to shoot a deer is fairly important. Some of us have been fortunate enough to have had the advantage of starting this adventure when we were young. For example, when I was younger I would often sneak through the woods by home, cross a river and hunt a large area where a cement factory had been set up. The place was riddled with Rabbits and had trails all through it. As I became more and more familiar with the area these gave me plenty of hunting options depending on the wind direction on any given day. Armed with a .22 caliber air rifle and not one of those modern gas fill ones that are a dime a dozen today but an old classic BSA break barrel single shot. Early on I discovered the limitations of my rifle, its bullet drop and the importance of shot placement on a rabbit. When it comes to shooting deer the principals are the same. Aim small miss small. Here are a few tips that will hold you in good stead so when you’re faced with the opportunity of securing your very first buck. Buck fever is the name given to the feeling us hunters get when we see a deer walk into a shooting lane. Our body’s release of adrenaline and it’s very difficult to manage even for seasoned hunters. This is a natural response from your body which stems back to the days where as a species we relied on the fight or flight for survival. Unfortunately, when you are hunting deer this is counterintuitive and neither of these responses is helpful. I have found that by having a clear process around shooting a deer that I practice over and over again at the range has transfer nicely to when I shoot a deer in the wild. When you are in the moment, chances are you will find your heart racing at a million miles an hour, and your breathing shorter and more rapid. You can literally feel the adrenaline being released and it can make it hard to think straight. Left unchecked can lead the way for fatal mistakes can be made. We have all heard the stories of hunting buddies who would have sworn black and blue that what they had shot at, was a deer, only to discover it was their mate. No hunter wants to find themselves in this position and no deer is worth all the grief that accompanies this scenario. By having your own little checklist in place it can force you to be more methodical and make for a better, safer hunter. For my kids, I have come up with an easy to remember acronym and its easy for them to remember because they are always banging on about getting their turn on it. I know it sounds simple but each is designed to break your natural tendencies and think critically about what you’re doing and override the haze of buck fever. Once you pull that trigger and the projectile is on its way it ain’t coming back so you better be sure it’s going where it’s meant to. This sounds fairly straightforward but it’s more than just identifying that what you’re about to pull the trigger on is a deer. Make time to identify if it’s a buck or a doe. If it’s a buck find out how many points can you count on its antlers? Then finally is the deer in good condition? The Texas heart shot might get the job done but it’s also quite good at spreading gut bacteria throughout the carcass. If you want to know how to shoot a deer you need to be aiming at the part of the deer that is artery rich. This is commonly known in deer hunting as the kill zone. The kill zone is easiest to identify when the deer is broadside (standing side on) and is approx 15 inches in diameter. From the point in which the front leg meets the body, you want to be aiming approx 3 inches above and an inch behind the leg. This will have you hitting the center of the deer’s engine room. If your shots on target you will shoot and sever the main arteries that feed the heart, the heart itself as well as put a big hole in both lungs. If your shots off in any direction by no more than 3 inches you will still clip the lungs. If you have had a bad shot and your shots gone higher than this, while it won’t be a kill shot it will clip the spine and the deer will drop on the spot. You can see why being patient for the deer to offer a broadside shot increases your odds of pulling off a fatal shot. 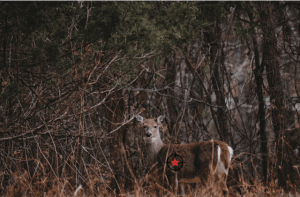 Regardless of the position your deer is standing, it’s this zone you want to be targeting with your shot. Try and avoid taking riskier shots such as the neck and head. 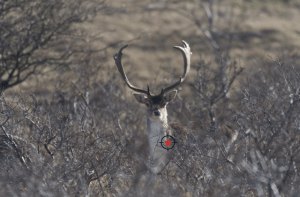 If executed correctly both will leave you with a bit more undamaged venison, however, there’s just a far greater chance for error with a smaller target zone. A misplaced bullet here can result in a badly wounded deer which will run a long way and likely experience a slow and painful death. 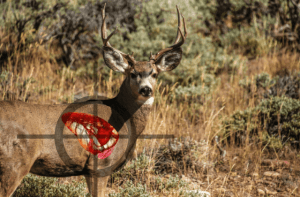 This ties in with the previous point, however, the angle you are shooting will have an effect on the path a bullet or arrow for that matter takes on its way through a deer’s body. 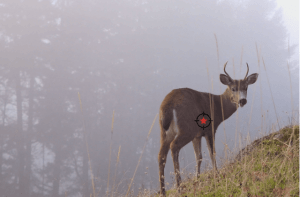 Any situation where you are going to be shooting at a deer on an angle, for example, a treestand or steep slope you want to consider in the back of your mind the likely point of exit of your projectile. For example, if your shooting uphill and you were to aim as you would have, had you been on the same level as the deer, your bullet angle could have you missing the vitals all together and pop out above the shoulder on the other side. This is definitely one of those handy tips I wish I hadn’t learned the hard way. As humans, we tend to overestimate our shooting distances. If you have been deer hunting awhile you will likely have a rangefinder or set of binoculars that eliminate some of the guesswork for you. I hate cheap optics but if your starting out even a low priced golf rangefinder is going to give you close enough data to get the job done. Early on I wasn’t in a position where I could afford these so I made sure my shots at deer were inside 100 yards. The odd time where I did have a crack outside of this I was generally quick enough to make the second shot count. Just be sure that you know that your rifle is shooting accurately at 100 yards. Without too much practice it should allow you to be comfortable out to 350 – 400 yards. Obviously, this would be dependant on the caliber rifle you hunt with and if you have any respect for your Quarry you should also understand its limitations. There you have it, Simple and sweat. 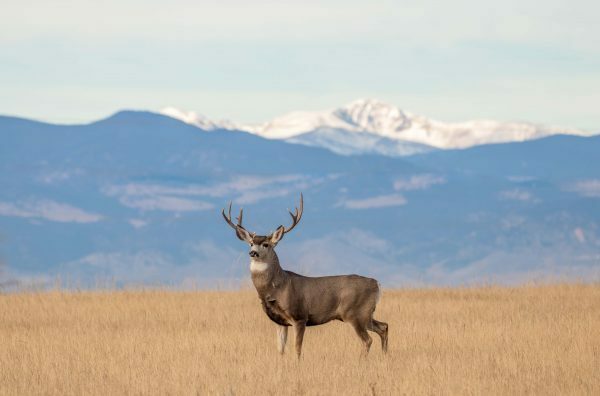 Remember the I-P-A-D rule on your next deer hunt. It will help you be a safer and more productive hunter. If you have found this helpful please remember to like and share this with a mate and we would love you to leave a comment below.